Start spreading the news; you should leave today, if you want to be a part of New York, why not stay in the heart of it. Manhattan is all about the hype, from flipping street performers to the hustling and bustling streets buzzing with people—New York is the place to be. DoubleTree by Hilton has opened a conveniently situated hotel in New York Times Square West. Located only minutes from some of New York’s best attractions like the Empire State Building, Times Square and Broadway, makes this establishment a first priority for visitors. Dozens of shops and restaurants surround the establishment, to make it easy and convenient for guests to shop until they drop, and then refuel with a famous slice of New York pizza. A stunning blend of the finest modern features and delicate thoughtful touches is set to make anyone’s New York stay a great experience. Any welcome by a cookie, is a good start to a trip. The signature warm DoubleTree Cookie, is presented upon arrival, and can be seen as a reflection of the warm welcoming and caring service expected during your stay. Breathtaking views of the Manhattan skyline can be ticked off the bucket list as guests sit back and relax with a cocktail at the Lovage Rooftop and Indoor Lounge. Unique cocktails, light fare and nightly live music all add to the ethereal atmosphere of kicking back and watching a timeless city light up at night. In addition to dining in style, quality is on the menu, with Executive Chef Alan Wise in charge of administering breakfast, lunch, and dinner to guests at the Magnolia restaurant. Guests may also order room service; or pick up snacks, sandwiches, salads, beer and wine in the convenient on-site 24-hour Made Market Pantry. 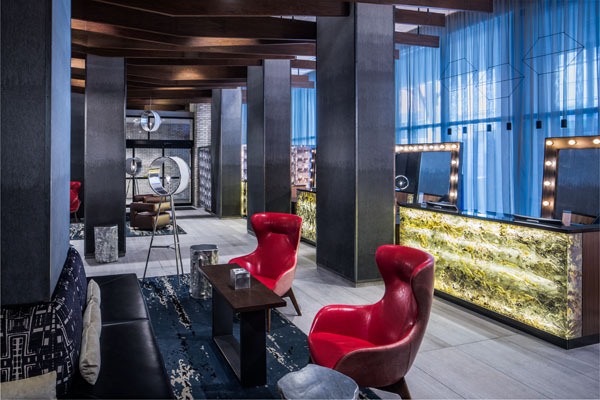 The 37-story hotel features 612 modern rooms, decorated with theatre-district inspired artwork and many offering-stunning views of the city or Hudson River. Each guest room comes equipped with Double Tree Sweet Dreams Sleep Experience beds for comfort and luxury, a work desk with Wi-Fi access and an adjustable desk chair, coffeemaker and a large opening window. An assortment of gourmet-in room tea and coffee offerings by The Coffee Bean and Tea Leaf, and a refreshing array of the Crabtree and Evelyn natural skin and body care line are all DoubleTree by Hilton brand amenities, and come complimentary to all guests. For those in the city for business purposes, can find the establishment capable of accommodating business meetings and events, with 1,000 square feet of meeting and banqueting facilities. A state of the art sound system, A/V equipment and a fully equipped 24-hour business center will ensure a smooth and professional presentation. Many people expect loyalty. DoubleTree is respecting this by offering an award winning guest-loyalty program called Hilton Honors. Hilton Honors members who book directly through Hilton channels save time and money, with an added bonus of gaining instant access to benefits. Some of the benefits include an exclusive member discount, free Wi-Fi and a flexible payment slider that allows members to choose nearly any combination of Points and money to book a stay.